The Hyper-V components are not enabled by default in Windows environments, probably because not all environments will be able to utilize virtualization, depending on their specific CPU limitations. To create and run virtual machines, install the Hyper-V role on Windows Server by using Server Manager or the Install-WindowsFeature cmdlet in Windows PowerShell. For Windows 10, see Install Hyper-V on Windows 10. To learn more about Hyper-V, see the Hyper-V Technology Overview. To try out Windows Server 2019, you can download and install an evaluation copy. See the Evaluation Center. Your computer hardware is compatible. For details, see System Requirements for Windows Server and System requirements for Hyper-V on Windows Server. You don't plan to use third-party virtualization apps that rely on the same processor features that Hyper-V requires. Examples include VMWare Workstation and VirtualBox. You can install Hyper-V without uninstalling these other apps. But, if you try to use them to manage virtual machines when the Hyper-V hypervisor is running, the virtual machines might not start or might run unreliably. 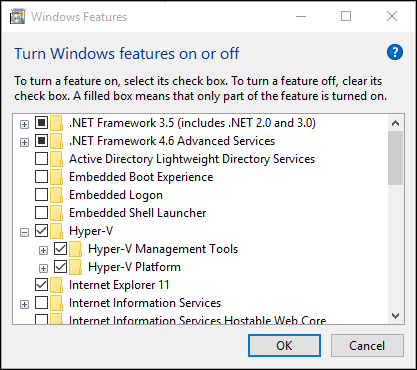 For details and instructions for turning off the Hyper-V hypervisor if you need to use one of these apps, see Virtualization applications do not work together with Hyper-V, Device Guard, and Credential Guard. If you want to install only the management tools, such as Hyper-V Manager, see Remotely manage Hyper-V hosts with Hyper-V Manager. When installation is finished, verify that Hyper-V installed correctly. Open the All Servers page in Server Manager and select a server on which you installed Hyper-V. Check the Roles and Features tile on the page for the selected server. To install Hyper-V on a server you're connected to remotely, run the following command and replace <computer_name> with the name of server. If you're connected locally to the server, run the command without -ComputerName <computer_name>. If you install this role on a server that runs the Server Core installation option of Windows Server 2016 and use the parameter -IncludeManagementTools, only the Hyper-V Module for Windows PowerShell is installed. You can use the GUI management tool, Hyper-V Manager, on another computer to remotely manage a Hyper-V host that runs on a Server Core installation. For instructions on connecting remotely, see Remotely manage Hyper-V hosts with Hyper-V Manager. Enable Hyper-V to create virtual machines on Windows 10. Hyper-V can be enabled in many ways including using the Windows 10 control panel, PowerShell (my favorite) or using the Deployment Imaging Servicing and Management tool (DISM). This documents walks through each option. Note: Hyper-V is built into Windows as an optional feature -- there is no Hyper-V download. The Hyper-V role cannot be installed on Windows 10 Home. Upgrade from Windows 10 Home edition to Windows 10 Pro by opening up Settings > Update and Security > Activation. For more information and troubleshooting, see Windows 10 Hyper-V System Requirements. Open a PowerShell console as Administrator. If the command couldn't be found, make sure you're running PowerShell as Administrator. When the installation has completed, reboot. The Deployment Image Servicing and Management tool (DISM) helps configure Windows and Windows images. Among its many applications, DISM can enable Windows features while the operating system is running. Open up a PowerShell or CMD session as Administrator. For more information about DISM, see the DISM Technical Reference. Right click on the Windows button and select ‘Apps and Features’. Select Programs and Features on the right under related settings. When the installation has completed you are prompted to restart your computer.